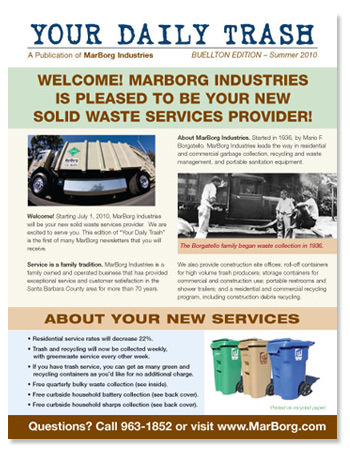 MarBorg Industries is a family owned and operated business that has provided exceptional waste management, recycling and related services in the greater Santa Barbara area for more than 70 years. Started in 1936, by Mario F. Borgatello, MarBorg Industries leads the way in residential and commercial garbage collection, recycling and waste management, and portable sanitation equipment. MarBorg Industries also provide construction site offices; roll-off containers for high volume trash producers; storage containers for commercial and construction use; portable restrooms and shower trailers; and a residential and commercial recycling program, including construction debris recycling. Starting in July 2010, Marborg Industries will provide Waste Collection, Recycling and Green Waste Recycling Services to residents of the City of Buellton. MarBorg Industries is the leading recycler in the greater Santa Barbara County region. Cowan Communication Arts worked with the MarBorg Industries staff to develop and design report and proposal covers, a newsletter and direct mail postcards for the City of Buellton services launch.